With the recent release of the UN report on the Ghouta chemical weapons attack, it is clear that the propaganda push against the Syrian government and Bashar al-Assad is still in full swing. Indeed, with headlines such as “Forensic Details in UN Report Point To Assad’s Use of Gas” by the New York Times and “UN report confirms chemical weapons use in Syria” by NBC, Western media outlets have done the thinking for the American people and have determined that not only did Assad use chemical weapons but that the UN investigators were responsible for this determination. Of course, the task of the investigators was not to determine who used the chemical weapons, only to determine whether or not they were used to begin with. Still, Western governments and their media mouthpieces have been adamant in placing the blame on Assad, despite all relevant and available evidence showing that it was, in fact, the death squads running rampant in Syria that used the chemical weapons. Yet, while so much attention has been placed on the UN chemical weapons report (which was not tasked with determining the guilt over who used the chemical weapons), very little attention has been paid to another report compiled by the International Support Team for Mussalaha (Consilience) in Syria for the International Institute For Peace, Justice, and Human Rights released on September 15, 2013. 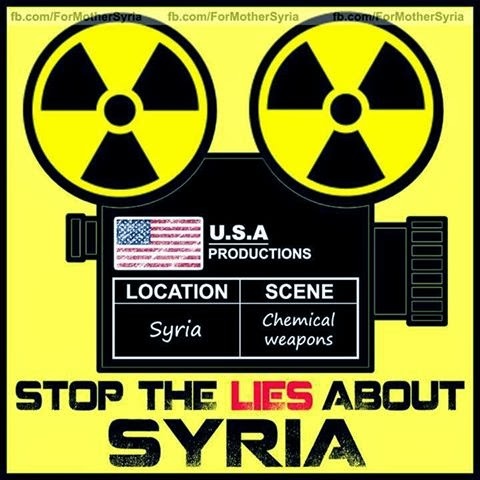 The report, entitled “The Chemical Attacks On East Ghouta: To Justify Military Right To Protect Intervention In Syria,” and authored largely by Mother Agnes Mariam of the Cross, who is President of ISTEAMS, not only argues that the chemical weapons attacks were the handiwork of the Syrian death squads, but also that the entire ordeal was a carefully crafted and planned propaganda campaign utilizing kidnapped citizens from Lattakiah, Syria as stage props. Lattakiah was the area which was invaded and overrun by death squads in early August 2013, with 11 Alawite villages being overrun on August 4and over 150 women and children abducted by Jobhat al Nusra. Allegedly, the Nusra Front was attempting to use them as ransom for the release of jailed detainees. In addition, shortly before the Ghouta chemical attack, dozens of civilians were abducted in Rabiha and marched through the streets as if they were cattle. While the whereabouts of these individuals were unknown ever since their disappearance, some of them were identified by virtue of photographs and YouTube videos shown to relatives of the chemical weapons attacks in Ghouta. In other words, a number of the Lattakiah kidnapping victims were later discovered in Ghouta as victims of the chemical weapons attack. Of course, unless these kidnapping victims managed to escape and then decided to start their lives over in Ghouta without telling their families back home and, additionally, did so all at the same time, it is indeed compelling evidence that the death squads were not only responsible for the chemical weapons attack but that they (most likely with Western help) were responsible for a coordinated and planned false flag attack which would subsequently be blamed on the Assad government. East Ghouta is a distant eastern suburb of Damascus that was until recently a farming community. The urban population came mostly from Damascus and fled there as refugees to family members when rebels seized the town. Ghouta is no longer a community that includes women and children, but rather an armed camp of militant men, including many violent zealots. The social picture represented in insurgent videos is at complete variance with the demographic facts and street scenes of Ghouta under occupation – there are no women or children to be seen at all. I was in Damascus two days before. There was the heaviest shelling from the Syrian legal army on the East Ghouta. Going out to Lebanon I have seen thousands of refugees fleeing the targeted areas. It means that the area that was already emptied from its population was more emptied during the heavy attack of the Syrian army. This boy, Abdullah, does not say where he lives in East Ghouta. He asserts what everybody in Damascus and its rural area knows: that most of the neighbors had already fled from their houses because the East Ghouta is a semi destroyed area due to the continuous clashes between the rebels and the Syrian army and the violent aerial strikes and shellings of the Syrian army. In short, the ISTEAMS report suggests, with relevant evidence, that women and children kidnapped in Lattakia and Rabiha were taken to Ghouta and used as stage props for a false flag attack to be blamed on Assad and used to justify a Western military action against Syria. The report also mentions photos and videos which were broadcast as photographic evidence of the death of the Ghouta residents early on in the immediate aftermath of the attacks and the propaganda push that followed it. ISTEAMS points out, however, that these photos and videos were not taken in Ghouta or even in Syria at all, but that they were actually photos taken from Cairo Egypt during the Muslim Brotherhood riots. The photos used to show dead bodies of Syrian adults were, in fact, photos of dead Muslim Brotherhood supporters in Egypt. Such ruthless propaganda efforts hearken back to the earlier efforts to frame the Syrian army for the Houla massacre or even the recent photograph touted by the BBC as evidence of a mass murder by the Assad regime – a child jumping over what appears to be hundreds of dead bodies wrapped in burial shrouds – but what actually turned out to be a photograph taken in Iraq in 2003. After insurgents murdered the men in these communities, they organized mass abductions of the surviving women and children. ISTEAMS’ report includes evidence that links these abductions to the ensuing chemical attacks(s) that killed mainly women, children, and infants in Ghouta, east of Damascus, on August 21, 2013. Women and children who went missing after their families were massacred in Latakia appear to be among the Ghouta victims shown in western propaganda videos. In the end, the Ghouta chemical attacks were, at best, an example of the Anglo-Americans and Western media seizing upon a crisis for a political purpose. 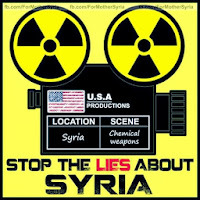 At worst, the attacks were an entirely staged and coordinated event designed to justify military action against Syria. Unfortunately, considering the evidence presented by the ISTEAMS report, the latter seems more likely.